Extreme poverty rates have been cut by more than half since 1990. While this is a remarkable achievement, one in five people in developing regions still live on less than $1.90 a day; there are millions more who make little more than this daily amount and many people risk slipping back into poverty. Case studies and other evidence documents the role forests and trees outside forests play in national economic growth, rural development and livelihoods. More than 1.6 billion people depend on forests in their daily lives and more than 300 million people are living in forests. Furthermore, forest products are a source of economic growth and employment in a global industry generating approximately $327 billion annually. 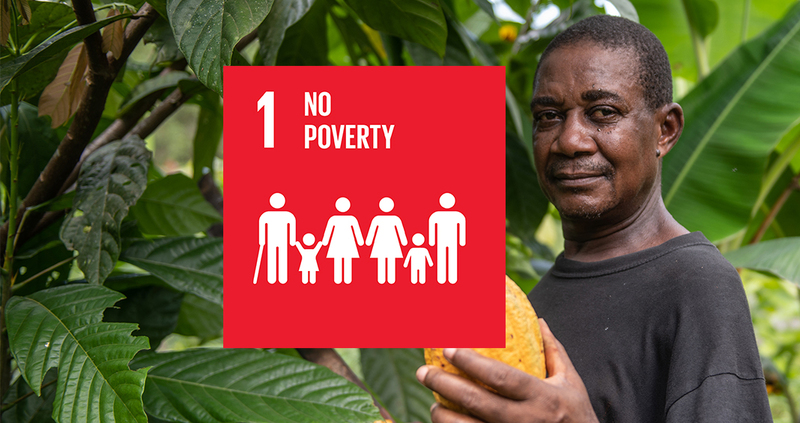 FSC contributes to goal 1 of no poverty in a variety of ways. Certified timber is crucial in combating the trade in illegal timber. Illegal logging encourages corruption, undermines tax payments and reduces income for producing countries. This limits the resources available for further investments in sustainable development. In some cases, FSC-certified smallholders and community foresters can gain additional income and security by applying for FSC certification. Some poverty-reducing benefits are directly defined in the FSC requirements; others depend more on the market and whether the customer is prepared, or able, to pay extra for products and/or agree to fair, long-term contracts. FSC’s contributions to poverty reduction are often more substantial in situations where people live in certified forests. FSC rules require the payment of reasonable wages, the protection of forest workers, and agreements with local populations to guarantee they receive a share of the benefits of forest management. This can include the construction and operation of schools and/or hospitals, which increase access to education and health care - two elements that contribute to the alleviation of poverty. 2.4 The Organization shall pay wages that meet or exceed minimum forest industry standards or other recognized forest industry wage agreements or living wages, where these are higher than the legal minimum wages. When none of these exist, The Organization shall through engagement with workers* develop mechanisms for determining living wages. 4.3 The Organization shall provide reasonable opportunities for employment, training and other services to local communities, contractors and suppliers proportionate to scale and intensity of its management Activities. 4.4 The Organization shall implement additional activities, through engagement with local communities, that contribute to their social and economic development, proportionate to the scale, intensity and socio-economic impact of its management activities.